This guide is written for anyone installing OpenIDM to manage and to provision identities, and to ensure compliance with identity management regulations. This guide covers the install and removal (uninstall) procedures that you theoretically perform only once per version. This guide aims to provide you with at least some idea of what happens behind the scenes when you perform the steps. This guide also takes you through all of the samples provided with OpenIDM. If you have a previous version of OpenIDM installed, see the Compatibility in the Release Notes section of the Release Notes before installing this version. OpenIDM requires Oracle Java SE 6 update 24 or later. The equivalent version of OpenJDK should work for evaluation, too. OpenIDM services run in an OSGi container with an embedded Servlet container, and an embedded noSQL database. By default the OSGi container is Apache Felix. The default Servlet container is Jetty. For OpenIDM 2.1, the only supported configuration is running the services in Apache Felix and Jetty. Follow the procedures in this section to install and run OpenIDM. Follow these steps to install OpenIDM. Make sure you have an appropriate version of Java installed. Check the release notes for Java requirements in the chapter, Before You Install OpenIDM Software in the Release Notes. Unpack the contents of the .zip file into the install location. (Optional) By default, OpenIDM listens for HTTP connections on port 8080. To change the default port, edit openidm/conf/jetty.xml. Before running OpenIDM in production, replace the default OrientDB repository provided for evaluation with a JDBC repository. See the chapter on Installing a Repository For Production for details. Follow these steps to run OpenIDM interactively. To run OpenIDM as a background process, see Starting and Stopping OpenIDM in the Integrator's Guide in the Integrator's Guide. Start the Felix container, load all OpenIDM services, and start a command shell to allow you to manage the container. At the resulting -> prompt, you can enter commands such as help for usage, or ps to view the bundles installed. To see a list of all the OpenIDM core services and their states, enter the following command. Alternatively, you can manage the container and services from the Felix administration console. Use these hints to connect to the console. Some basic hints on using the Felix administration console follow. Select the Components tab to see OpenIDM core services and their respective states. Select the Shell tab to access the -> prompt. Select the System Information tab to stop or restart the container. OpenIDM provides RESTful access to users in the OpenIDM repository. To access the OpenIDM repository over REST, you can use a browser-based REST client, such as the Simple REST Client for Chrome, or RESTClient for Firefox. Alternatively you can use the curl command-line utility that is included with most operating systems. For more information on curl, see http://curl.haxx.se/. If you cannot locate the curl command on your system, you can download it from http://curl.haxx.se/download.html. Access the following URL to get a JSON file including all users in the OpenIDM repository. Create a user joe by sending a RESTful PUT. Fetch the newly created user from the repository with a RESTful GET. OpenIDM returns the JSON object all on one line. To format the JSON for legibility, use a JSON parser, such as jq. Notice that more attributes are returned for user joe than the attributes you added in the previous step. The additional attributes are added by a script named onCreate-user-set-default-fields.js that is triggered whan a new user is created. For more information, see Managed Object Configuration in the Integrator's Guide in the Integrator's Guide. You can stop OpenIDM Services from the -> prompt, or through the Felix console. Either enter the shutdown command at the -> prompt. Or click Stop on the System Information tab of the Felix console, by default http://localhost:8080/system/console. This stops the Servlet container as well, and the console is no longer accessible. This chapter provides an overview of the first sample and how it is configured. To see a listing and an overview of the rest of the samples provided, see the README found in openidm/samples and in the chapter More OpenIDM Samples. Install OpenIDM as described in the chapter on Installing OpenIDM Services. OpenIDM comes with an internal noSQL database, OrientDB, for use as the internal repository out of the box. This makes it easy to get started with OpenIDM. OrientDB is not yet supported for production use, however, so use a supported JDBC database when moving to production. If you want to query the internal noSQL database, you can download OrientDB (version 1.3.0) from http://code.google.com/p/orient/downloads/list. You will find the shell console in the bin directory. Start OrientDB console using either console.sh or console.bat, and then connect to the running OpenIDM with the connect command. When you have connected to the database, you might find the following commands useful. You can also use OrientDB Studio to query the default OrientDB repository. After you have installed and started OpenIDM, point your browser to http://localhost:2480/studio/. The default database is openidm and the default user and password are admin and admin. Click Connect to connect to the repository. For more information about OrientDB Studio, see the OrientDB Studio documentation. OpenIDM connects identity data objects held in external resources by mapping one object to another. To connect to external resources, OpenIDM uses OpenICF connectors, configured for use with the external resources. When objects in one external resource change, OpenIDM determines how the changes affect other objects, and can make the changes as necessary. This sample demonstrates how OpenIDM does this by using reconciliation and synchronization. OpenIDM reconciliation compares objects in one object set to mapped objects in another object set. Reconciliation can work in write mode, where OpenIDM writes changes to affected objects, or in report mode, where OpenIDM reports on what changes would be written without making the changes. OpenIDM synchronization reflects changes in objects to any mapped objects, making changes as necessary to create or remove mapped objects and links to associate them. For a more thorough explanation of reconciliation and synchronization, see the section on Types of Synchronization in the Integrator's Guide in the Integrator's Guide. This sample connects to an XML file that holds sample user data. The XML file is configured as the authoritative source. In this sample, users are created in the local repository to show you how you can manage local users through the REST APIs. You can also use OpenIDM without storing managed objects for users in the local repository, instead reconciling and synchronizing objects directly through connectors to external resources. Furthermore, this sample involves only one external resource. In practice, you can connect as many resources as needed for your deployment. You can find configuration files for the sample under the openidm/samples/sample1/conf directory. As you review the sample, keep the following in mind. You must start OpenIDM with the sample configuration ($ ./startup.sh -p samples/sample1). For more information, see Section 2.3, "Running Reconciliation". OpenIDM regularly scans for any scheduler configuration files in the conf directory. OpenIDM's reconciliation service reads the mappings and actions for the source and target users from conf/sync.json. Reconciliation runs, querying all users in the source, and then creating, deleting, or modifying users in the local OpenIDM repository according to the synchronization mappings. OpenIDM writes all operations to the audit logs in both the internal database and also the flat files in the openidm/audit directory. The following configuration files play important roles in this sample. This connector configuration file serves as the XML file resource. In this sample, the connector instance acts as the authoritative source for users. In the configuration file you can see that the xmlFilePath is set to samples/sample1/data/xmlConnectorData.xml, which contains two users, in XML format. For details on the OpenICF connector configuration files see Connecting to External Resources in the Integrator's Guide in the Integrator's Guide. The sample schedule configuration file defines a reconciliation job that, if enabled by setting "enabled" : true, starts a reconciliation each minute for the mapping named systemXmlAccounts_managedUser. The mapping is defined in the configuration file, conf/sync.json. For information about the schedule configuration see Scheduling Tasks and Events in the Integrator's Guide in the Integrator's Guide. Apart from the scheduled reconciliation run, you can also start the reconciliation run through the REST interface. The call to the REST interface is an HTTP POST such as the following. This sample configuration file defines the configuration for reconciliation and synchronization. The systemXmlAccounts_managedUser is the mapping for the reconciliation. This entry in conf/sync.json defines the synchronization mappings between the XML file connector (source) and the local repository (target). Source and target paths that start with managed, such as managed/user, always refer to objects in the local OpenIDM repository. Paths that start with system, such as system/xmlfile/account, refer to connector objects, in this case the XML file connector. To filter objects from the resource for a particular target, you can use the validTarget script in the mapping to ensure that only users who match specified criteria are considered part of the reconciliation. You can use an onCreate script in a mapping to set default values for a user created in the target resource. For details on scripting see the Scripting Reference in the Integrator's Guide appendix in the Integrator's Guide. For more information about synchronization, reconciliation, and sync.json, see Configuring Synchronization in the Integrator's Guide in the Integrator's Guide. Start OpenIDM with the configuration for sample 1. To see what happened, look at the CSV format log file, openidm/audit/recon.csv. After reconciliation runs, you can use the REST interface to display all users in the local repository. Use a REST client to perform an HTTP GET on the following URL: http://localhost:8080/openidm/managed/user/?_queryId=query-all-ids with the headers "X-OpenIDM-Username: openidm-admin" and "X-OpenIDM-Password: openidm-admin". OpenIDM returns a JSON file. Depending on your browser, it can display the JSON or download it as a file. Alternatively, you can use the following curl command to get the JSON file. If you created user joe as described previously in this guide, you see IDs for three users. The second and third users, bjensen and scarter, were created during the reconcililation. Now try a RESTful GET of user bjensen by appending the user ID to the managed user URL (http://localhost:8080/openidm/managed/user/). In the OrientDB console, connect to the database, and then query the users and audit logs. The following shows edited excerpts from a console session querying OrientDB. To make it easier to view the records, the first query only requests three specific fields. 3 item(s) found. Query executed in 0.0040 sec(s). 18 item(s) found. Query executed in 0.0090 sec(s). 4 item(s) found. Query executed in 0.0070 sec(s). This information is also available in the CSV format audit logs located in the openidm/audit directory. Add a user to the source connector XML data file to see reconciliation in action. During the next reconciliation, OpenIDM finds the new user in the source connector, and creates the user in the local repository. To add the user, copy the following XML into openidm/samples/sample1/data/xmlConnectorData.xml. Run reconciliation again, as described in the section on Running Reconciliation. After reconciliation has run, query the local repository to see the new user appear in the list of all users under http://localhost:8080/openidm/managed/user/?_queryId=query-all-ids. Also look at the reconciliation audit log, openidm/audit/recon.csv to see what took place during reconciliation. This formatted excerpt from the log covers the two reconciliation runs done in this sample. The important fields in the audit log are the action, the situation, the source sourceObjectId, and the target targetObjectId. For each object in the source, reconciliation results in a situation that leads to an action on the target. In the first reconciliation run (the abbreviated reconID is shown as 486...), the source object does not exist in the target, resulting in an ABSENT situation and an action to CREATE the object in the target. The object created earlier in the target does not exist in the source, and so is IGNORED. In the second reconciliation run (the abbreviated reconID is shown as aa9...), after you added a user to the source XML, OpenIDM performs an UPDATE on the user objects bjensen and scarter that already exist in the target, in this case changing the internal ID. OpenIDM performs a CREATE on the target for the new user (tmorris). You configure the action that OpenIDM takes based on an object's situation in the configuration file, conf/sync.json. For the list of all possible situations and actions, see the Configuring Synchronization in the Integrator's Guide chapter in the Integrator's Guide. For details on auditing, see the Using Audit Logs in the Integrator's Guide chapter in the Integrator's Guide. You can also add users directly to the local repository through the REST interface. The following example adds a user named James Berg. OpenIDM creates the new user in the repository. If you configure a mapping to apply changes from the local repository to the XML file connector as a target, OpenIDM then updates the XML file to add the new user. The current distribution of OpenIDM comes with a variety of samples in openidm/samples/. Sample 1 is described in First OpenIDM Sample. This chapter describes the remaining OpenIDM samples. Install OpenIDM, as described in Installing OpenIDM Services. Each sample folder in openidm/samples/ contains a list of sub folders, such as conf/ and script/, depending on which files you need to run the sample. The easiest way to configure a new installation for one of the samples is to use the -p option of the startup command to point to the directory whose configuration you want to use. Some, but not all samples require additional software, such as an external LDAP server or database. When you move from one sample to the next, bear in mind that you are changing the OpenIDM configuration. Install an instance of OpenIDM specifically to try the samples. That way you can experiment as much as you like, and discard the result if you are not satisfied. Shut down OpenIDM, and delete the openidm/felix-cache directory before you try a new sample. Sample 1 is described in the chapter, First OpenIDM Sample. Sample 2 resembles the first sample, but in sample 2 OpenIDM is connected to a local LDAP server. The sample has been tested with OpenDJ directory server, but it should work with any LDAPv3 compliant server. 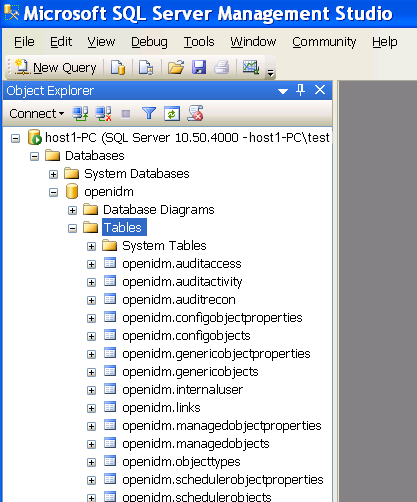 Sample 2 demonstrates how OpenIDM can pick up new or changed objects from an external resource. The sample contains only one mapping, from the external LDAP server resource to the OpenIDM repository. The sample therefore does not push any changes made to OpenIDM managed user objects out to the LDAP server. The LDAP server runs on the local host. The LDAP server listens on port 1389. A user with DN cn=Directory Manager and password password has read access to the LDAP server. User objects are stored on the LDAP server under base DN ou=People,dc=example,dc=com. User objects have the object class inetOrgPerson. An example user object follows. Prepare the LDAP server by creating a base suffix of dc=example,dc=com, and importing these objects from samples/sample2/data/Example.ldif. Prepare OpenIDM as described in Section 3.1.2, "Preparing OpenIDM", then start OpenIDM with the configuration for sample 2. Run reconciliation over the REST interface. Successful reconciliation returns an "_id" object. With the configuration of sample 2, OpenIDM creates user objects from LDAP in OpenIDM, assigning the new objects random unique IDs. To list user objects by ID, run a query over the REST interface. The resulting JSON object should look something like this, but all on one line. To retrieve the user, get the object by ID. Read openidm/samples/sample2/conf/sync.json and openidm/samples/sample2/conf/provisioner.openicf-ldap.json to understand the layout of the user object in the repository. Like sample 2, sample 2b also connects to an external LDAP server. Unlike sample 2, however, sample 2b has two mappings configured, one from the LDAP server to the OpenIDM repository, and the other from the OpenIDM repository to the LDAP server. Configure the LDAP server as for sample 2, Section 3.3.1, "LDAP Server Configuration". The LDAP user must have write access to create users from OpenIDM on the LDAP server. Prepare OpenIDM as described in Section 3.1.2, "Preparing OpenIDM", then start OpenIDM with the configuration for sample 2b. With the configuration of sample 2b, OpenIDM creates user objects from LDAP in OpenIDM, assigning the new objects random unique IDs. To list user objects by ID, run a query over the REST interface. Run reconciliation again to create the new user in the LDAP directory. Test that the reconciliation has been successful by locating the new user in the LDAP directory. Like sample 2b, sample 2c also connects to an external LDAP server. The only difference is that in sample 2c, LDAP Group Memberships are synchronized. The user with dn uid=jdoe,ou=People,dc=example,dc=com is also imported with the Example.ldif file. Prepare OpenIDM as described in Section 3.1.2, "Preparing OpenIDM", then start OpenIDM with the configuration for sample 2c. With the configuration of sample 2c, OpenIDM creates user objects from LDAP in OpenIDM, assigning the new objects random unique IDs. To list user objects by ID, run a query over the REST interface. This will change the user's ldapGroups property in OpenIDM from "cn=openidm,ou=Groups,dc=example,dc=com" to "cn=openidm2,ou=Groups,dc=example,dc=com" and, as a result, the user will be removed from the one LDAP group and added to the other LDAP group on OpenDJ. By default, automatic synchronization is enabled. This means that when you update a managed object, any mappings defined in the sync.json file are automatically executed to update the target system. For more information, see Synchronization Mappings File in the Integrator's Guide in the Integrator's Guide. Sample 2d also connects to an external LDAP server. This sample focuses on LDAP Group synchronization. Prepare OpenIDM as described in Section 3.1.2, "Preparing OpenIDM", then start OpenIDM with the configuration for sample 2d. Run reconciliation for the groups mapping over the REST interface. With the configuration of sample 2d, OpenIDM creates group objects from LDAP in OpenIDM. To list group objects by ID, run a query over the REST interface. To retrieve a group, get the object by ID. Sample 3 shows an example configuration for the Scripted SQL connector. The Scripted SQL connector communicates with the database through configurable SQL scripts. Each operation, like create or delete, is represented by its own script. Prepare a fresh installation of OpenIDM before trying this sample. In this example OpenIDM communicates with an external MySQL database server. The database is available on the local host. The database listens on port 3306. You can connect over the network to the database with user root and password password. MySQL serves a database called HRDB with a table called Users. The database schema is as described in the data definition language file, openidm/samples/sample3/data/sample_HR_DB.mysql. Import the file into MySQL before running the sample. Make sure MySQL is running. Prepare OpenIDM as described in Section 3.1.2, "Preparing OpenIDM". OpenIDM requires a MySQL driver, the MySQL Connector/J. Download MySQL Connector/J, version 5.1 or later. Unpack the delivery and copy the .jar into the openidm/bundle directory. In openidm/samples/sample3/conf/provisioner.openicf-scriptedsql.json, edit the paths to the scripts (starting with /opt/openidm/) to match your installation. Start OpenIDM with the configuration for sample 3. The check method, executed for each connected resource, executes a select * from Users statement. The sample 3 sync.json configuration file contains a mapping to reconcile OpenIDM and the external database. Run the reconciliation with the following command. Reconciliation creates the five users from the database in the OpenIDM repository. Check the result with the following command. The result should resemble the following JSON object. To view the JSON for one of the users, get the user by the value of the _id. Sample 4 deals with a comma-separated value file as the external resource. The file name is part of the sample configuration. Therefore you do not need to manage any other external resources. No external configuration is required for this sample. Prepare OpenIDM as described in Section 3.1.2, "Preparing OpenIDM", then start up OpenIDM with the configuration of sample 4. Check the results of reconciliation with the following command. The result should resemble the following JSON object, but all on one line. Sample 5 demonstrates the flow of data from one external resource to another. The resources are called LDAP and AD, but in the sample both directory-like resources are simulated with XML files. No external configuration is required for this sample. Prepare OpenIDM as described in Section 3.1.2, "Preparing OpenIDM", then start up OpenIDM with the configuration of sample 5. The XML files that are used are located in the openidm/samples/sample5/data/ folder. When you start OpenIDM with the sample 5 configuration, it creates xml_AD_Data.xml, which does not contain users until you run reconciliation. Run reconciliation between OpenIDM and the pseudo-LDAP resource. This command creates a user in the repository and also in the pseudo AD resource, represented by the samples/sample5/data/xml_AD_Data.xml file. Sample 6 resembles sample 5, but sample 6 uses two real LDAP connections. The default sample configuration assumes two LDAP server instances running on the local host, but listening on different LDAP ports. To simplify setup, you can configure both provisioners to point to the same LDAP server, and only use different base DNs, so you can simulate use of two directory servers with a single OpenDJ directory server, for example. Sample 6 picks up new and changed users from the LDAP suffix, ou=people,dc=example,dc=com, and sends updates to the "Active Directory" suffix ou=people,o=ad. To keep the example relatively simple, no configuration is provided for the flow from AD to LDAP. Out of the box, the sample provisioners are configured to use two independent LDAP servers, one listening on port 1389 and one on port 4389. To simplify your setup, you can change the sample to connect to a single LDAP server representing both external resources by using the same port numbers in both provisioner .json files. For example, change conf/provisioner.openicf-ad.json so that the port number line reads "port" : 1389. With LiveSync, OpenIDM detects changes in an external resource as they happen. OpenIDM detects changes in OpenDJ by reading the External Change Log (ECL). The ECL is presented as an LDAP subtree with base DN cn=changelog. Each change is represented as an entry in the subtree. Each change entry remains in the subtree until the log is purged (by default every three days). You turn on the external change log in OpenDJ by enabling replication. OpenDJ provides the change log even if it does not, in fact, replicate data to another OpenDJ server. Note that OpenDJ will log, in this case, harmless error messages if replication is enabled without a connection to another replica. To enable replication without another server, set up replication when you install OpenDJ. 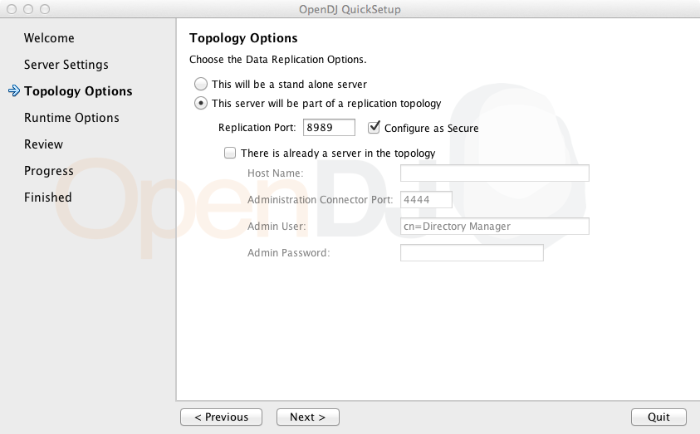 Sample 6 provides the configuration for two external LDAP servers, set up as follows. Both LDAP servers run on the local host. The LDAP server "LDAP" listens on port 1389. Both LDAP servers have a user with DN cn=Directory Manager and password password who can read and write to the data and read the change log. Base DN ou=people,o=ad for the connector called "AD". Base DN ou=people,dc=example,dc=com for the connector called "LDAP". The LDIF representation of an example user is as follows. Prepare the LDAP servers by creating the base DN dc=example,dc=com on the first server and o=AD on the second server, and then importing the following objects. For the "LDAP" directory, import samples/sample6/data/Example.ldif. For the "AD" directory import samples/sample6/data/AD.ldif. Prepare OpenIDM as described in Section 3.1.2, "Preparing OpenIDM", then start OpenIDM with the configuration for sample 6. The following sections show how to run the sample once off, with reconciliation, and continuously with LiveSync. Start up OpenIDM, and then run reconciliation over the REST interface. The result of a successful reconciliation is an _id object. With the configuration for sample 6, OpenIDM creates user objects from LDAP in the internal repository, and also in the target AD suffix. After reconciliation, list all users in the repository. To read the user object, use the _id value. The result should resemble the following JSON object, though all on one line. You can start reconciliation by using a schedule configuration or by using the REST interface directly. However, you must start LiveSync by using a schedule. The sample comes with the following schedule configuration file for LiveSync in samples/sample6/conf/schedule-activeSynchroniser_systemLdapAccount.json. LiveSync is disabled by default. Activate LiveSync by editing the file, schedule-activeSynchroniser_systemLdapAccount.json, to change the "enabled" property value to true. With LiveSync enabled, you can add and change LDAP users, and see the changes in AD as OpenIDM flows the data between resources dynamically. Sample 7 demonstrates how you can use OpenIDM to expose user data with a SCIM-like schema. The sample uses the XML file connector to read in attributes from external accounts and construct a JSON object for users stored in the OpenIDM repository. For more information about SCIM schema, see System for Cross-Domain Identity Management: Core Schema 1.1. Prepare OpenIDM as described in Section 3.1.2, "Preparing OpenIDM", then start OpenIDM with the configuration for sample 7. Run a reconciliation to pull the user from samples/sample7/data/xmlConnectorData.xml into the OpenIDM internal repository. Reconciliation creates a user object in the repository. Retrieve the user from the repository. The user object has the following JSON representation. "streetAddress": "100 Universal City Plaza"
"streetAddress": "222 Universal City Plaza"
"lastModified": "Tue Dec 04 2012 17:22:56 GMT+0200 (SAST)"
The sample scripts (samples/sample7/script/setScim*.js) transform the user data from the resource into the JSON object layout required by SCIM schema. OpenIDM provides a logger object with debug(), error(), info(), trace(), and warn() functions that you can use to log messages to the OpenIDM console from your scripts. Prepare OpenIDM as described in Section 3.1.2, "Preparing OpenIDM", then start OpenIDM with the configuration for sample 8. The scripts under samples/sample8/script/ show brief log message examples. Notice the log messages displayed on the OpenIDM (Felix) console. The following example omits timestamps and so forth to show only the message strings. When the request is approved by an administrator, the absent users are created by an asynchronous reconciliation process. Prepare OpenIDM as described in Section 3.1.2, "Preparing OpenIDM", then start OpenIDM with the configuration for sample 9. The reconciliation starts an approval workflow for each ABSENT user. These approval workflows (named managedUserApproval) wait for the request to be approved by an administrator. Query the invoked workflow task instances over REST. The request returns a workflow process ID. Approve the requests over REST, by setting the "requestApproved" parameter for the specified task instance to "true". Once the request has been approved, an asynchronous reconciliation operation runs, which creates the users whose accounts were approved in the previous step. List the users that were created by the asynchronous reconciliation. By default, OpenIDM uses OrientDB for its internal repository so that you do not have to install a database in order to evaluate OpenIDM. Before using OpenIDM in production, however, you must replace OrientDB with a supported repository. OpenIDM 2.1 supports the use of MySQL and MS SQL as an internal repository. For details of the supported versions, see Before You Install OpenIDM Software in the Release Notes in the Release Notes. Download MySQL Connector/J, version 5.1 or later from the MySQL website. Unpack the delivery, and copy the .jar into the openidm/bundle directory. Make sure that OpenIDM is stopped. Copy openidm/samples/misc/repo.jdbc.json to the openidm/conf directory. Import the data definition language script for OpenIDM into MySQL. This step creates an openidm database for use as the internal repository, and a user openidm with password openidm who has all the required privileges to update the database. Update openidm/conf/repo.jdbc.json as necessary, to reflect your MySQL deployment. When you have set up MySQL for use as the OpenIDM internal repository, start OpenIDM to check that the setup has been successful. After startup, you should see that repo.jdbc is active, whereas repo.orientdb is unsatisfied. These instructions are specific to MS SQL Server 2008 R2 Express running on a local Windows XP system. Adapt the instructions for your environment. OpenIDM requires SQL Server authentication. During the MS SQL Server installation, make sure that you select SQL Server authentication and not just Windows authentication. Expand the SQL Server Network Configuration item and select "Protocols for SQLEXPRESS"
Select the IP Adresses tab and set the addresses and ports on which the server will listen. Restart MS SQL Server for the configuration changes to take effect. To restart the server, select SQL Server Services in the left pane, double click SQL Server (SQLEXPRESS) and click Restart. After you have installed MS SQL on the local host, install OpenIDM, if you have not already done so, but do not start the OpenIDM instance. Import the data definition and set up OpenIDM to use the new repository, as described in the following steps. Use SQL Management Studio to import the data definition language script for OpenIDM into MS SQL. On the Connect to Server panel, select SQL Server Authentication from the Authentication drop down list and log in as the current user (for example, Administrator). Select File > Open > File and navigate to the OpenIDM data definition language script ( path\to\openidm\db\scripts\mssql\openidm.sql). Click Open to open the file. OpenIDM requires an MS SQL driver that must be created from two separate jar files. Create the driver as follows. Download the JDBC Driver 4.0 for SQL Server (sqljdbc_4.0.2206.100_enu.tar.gz) from Microsoft's download site. The precise URL may vary, depending on your location. Extract the executable Java archive file (sqljdbc4.jar) from the zip file, using 7-zip or an equivalent file management application. Copy the file to openidm\db\scripts\mssql. Download the bnd Java archive file (biz.aQute.bnd.jar) that enables you to create OSGi bundles. The file can be downloaded from http://dl.dropbox.com/u/2590603/bnd/biz.aQute.bnd.jar. For more information about bnd, see http://www.aqute.biz/Bnd/Bnd. This step creates a single .bar file, named sqljdbc4.bar. Rename the sqljdbc4.bar file to sqljdbc4-osgi.jar and copy it to the openidm\bundle directory. Remove the default OrientDB repository configuration file (openidm\conf\repo.orientdb.json) from the configuration directory. Copy the repository configuration file for MS SQL (openidm\samples\misc\repo.jdbc.json) to the configuration directory. Rename the MS SQL repository configuration file to repo.jdbc.json. Update openidm\conf\repo.jdbc.json as necessary, to reflect your MS SQL deployment. Specifically, check that the port matches what you have configured in MS SQL. When you have completed the preceding steps, start OpenIDM to check that the setup has been successful. After startup, you should see that repo.jdbc is active, whereas repo.orientdb is unsatisfied. (Optional) Stop OpenIDM services if they are running, by entering shutdown at the -> prompt either on the command line, or on the System Information tab of the Felix console. Remove the file system directory where you installed OpenIDM software. Shutdown OpenIDM, as described in To Stop the OpenIDM Services. Start OpenIDM in the new location.